​​​​ ​HOUSTON – A $16.37 million Texas Department of Transportation project on FM 1960 originally scheduled to go out to bid a year ago will not begin in 2019 and has been pushed back to February 2020. 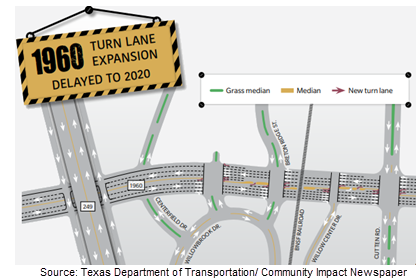 The project, which will likely take two years to complete, seeks to address congestion on FM 1960 near Willowbrook Mall by adding right- and left-turn lanes between Cutten Rd. and Centerfield Dr.
FM 1960 was named one of the state’s 100 most-congested corridors, according to a 2018 Texas A&M Transportation Institute study. ​Check out Houston-The Woodlands-Sugar Land Infrastructure ＆ Transportation Market Research.